An unexpected eruption from Mount Vesuvius in 79 AD has preserved Pompeii till the present. This small provincial city/ large town, which had a population of approximately 15,000 at the time of the eruption, has provided a wide ranging and vast amount of knowledge for us to uncover – Especially about the daily life of Roman citizens. 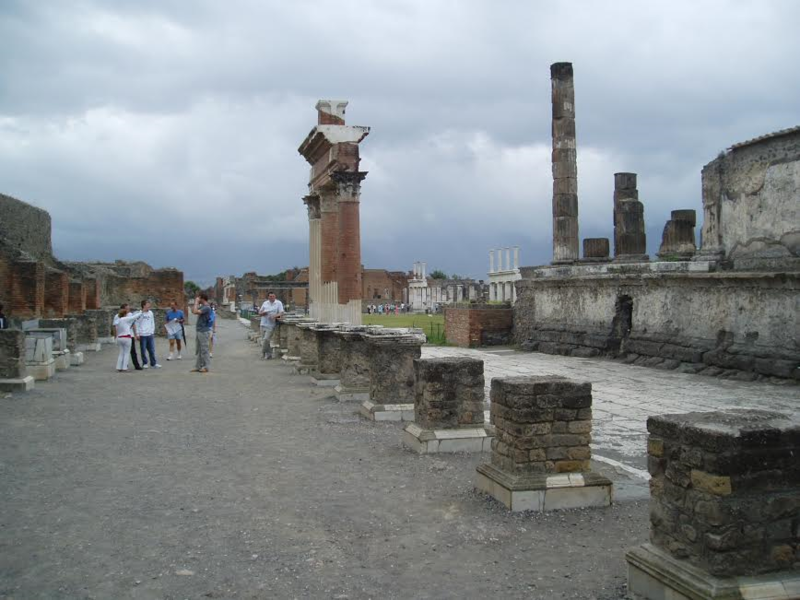 I feel it is only right to discuss ten of Pompeii’s top attractions and the history behind these sites. The vastly ruined Forum of today, like most Roman settlements, was in fact the centre of city life at one point in time. 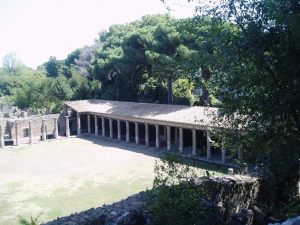 Although located in the south west of the town; key political, religious and business buildings were all centered around the Forum. Some notable buildings to look out for includes, the Marcellum (a covered meat and fish market) and the 2nd century BC Basilica (a law court and centre for business/financial transactions) at the southern end of the forum. The physical space of the Forum use to be where people socialized and political candidates would run in elections. It’s hard to imagine the hustle and bustle of the place now. 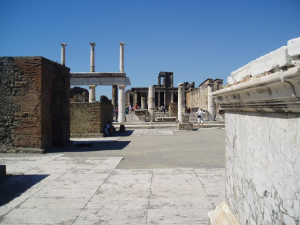 Just before Pompeii’s destruction, there were four notable temples positioned along the Forum. The sites cemented the town’s status as a religious centre, dedicated to the Gods: Jupiter, Apollo and to the worship of the Imperial cult (the Emperor). The latter was done at two different temples, one through direct worship and the other where the Emperor’s ancestral spirit was worshiped. The main Forum in Pompeii looking onto the Temple of Apollo in the west foreground. In my opinion the most impressive religious site left today, is at the northern end of the Forum is; the Temple of Jupiter. Established just after Pompeii had become a Roman colony in 80 BC, this structure still looks grand and important to this day. This building acts as a prominent reminder of the power of the Roman state religion at the time. There were many different shops and traders in the commercial hub of Pompeii (85 to be exact), however some of the most interesting business around to see are the thirty different bakeries dotted around the city – although mainly located on the main thoroughfares of the city. Many of the features in these bakery establishments, such as the ovens or milling stones for corn; where the bread is produced from start to finish in front of you, are remarkably well preserved – well worth a look. 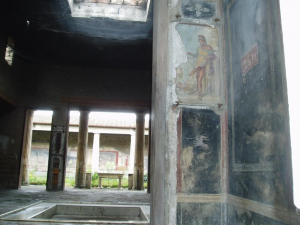 The first of the two must see aristocratic houses in Pompeii is the House of Faun. This well preserved gigantic dwelling, constructed in 120 BC, was home to a wealthy citizen of the city just before the eruption. 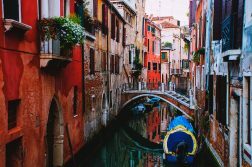 Although the name of the owner is unknown , there are some famous and notable features to look out for that may reveal something about the owners identity. The most famous of which is displayed in the form of a mosaic on the floor of the summer room, which depicts, Alexander the Great defeating the Great Persian King, Darius the Great, at the Battle of Issus (southern modern day Turkey) in 333 BC. The fact the owner had two atriums (reception rooms, one of which contained a dancing statue of a Faun) and a peristylums (private colonnaded gardens). Coupled with the fact that political supporters would come straight into the master’s Tablinum (office) from the street, further indicates the owner’s political and commercial power. The other aristocratic House is named after two wealthy brothers (Vetti), who although freedmen at the time, had once been slaves. Their signs of wealth are clearly visible for you to see again, one of which was that there were no shops attached to the house, which suggests that the owners had no need to gain an income from renting out part of their home to shopkeepers. The brother’s eye for beauty and culture is also reflected in certain features such as a the Peristylum and the classical mythological paintings of figures such as Cupid. Looking into the Peristylum of the House of the Vetii. Out of the three different public baths constructed in the city, the most impressive surviving one in my opinion is the Stabian baths. Constructed in the 4th century BC, it ran as a typical roman Bath complex bar its gigantic size. 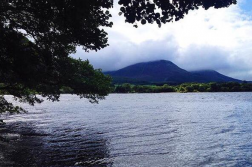 Some of the key features to think about when you are going around, is firstly, the bathing area was divided along gender lines – with men having a much larger area. 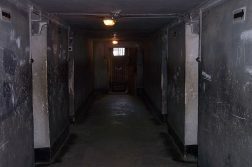 There was also a specific process where one would do exercise and then go through a series of bathing rooms in order to cleanse yourself thoroughly. The baths had other uses, namely they were an important place to socialize and to meet with business contacts. 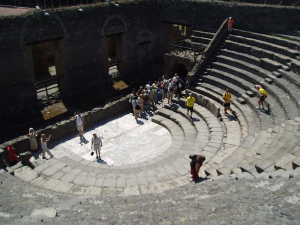 Pompeii had two permanent stone theatres at the time of the eruption. The smaller theatre was used for poetry and music recitals, however the larger semi-circular shaped theatre, is the main site to focus on in the south of the city. Rome had inherited this theatre from the previous inhabitants of the city, the Samnite’s, who constructed it in the second century BC. The Romans did however, enlarged the theatre to a capacity of 5,000 people. Although hard to imagine today, the theatre was massively important to the people who gathered to enjoy a show much like one you would see today,with actors, a stage, a musical orchestra and setting all being part of the performance. A lack of historical evidence from the theatre means that it is impossible to know exactly what types of adapted Greek dramas and comedies were performed here, although the tombstones do suggest that pantomimes were likely to be performed. Although much less impressive than the Colosseum, Pompeii’s gladiatorial amphitheatre is still a must see attraction, as it one of the first permeant stone buildings of its type to be found anywhere in Empire – it was constructed in 70 BC. Considering it held up to 20,000 people, it is remarkably well persevered. Just try to imagine the gladiatorial combats and the tensions this could be caused in such a massive crowd? One incident spiraled completely out of control in 59 AD when a fierce riot broke out, caused by rivalry between the citizens of Pompeii and the local town of Nuceria. After this appalling incident, the Emperor Nero declared that Pompeii was banned from holding any gladiatorial games for the next 10 years. The gladiators also had their own Barracks, where they lived and train, which are on the opposite side of the city to where the arena is. It is believed they trained after the earthquake from 62 AD on wards in a large colonnaded open space because gladiatorial armour has been found around the square, rather than at the aristocratic house that had been used to the north of the city. The gladiatorial barracks, in Pompeii’s later history. Although this Villa is on the outskirts of the main site, it is still worth a look if you have time. Re- opened to the pubic in 2015, this second century villa was built on an artificially raised platform and has an encompassing of 60 rooms in total. The house is named after a famously renowned mural, which depicts an initiation into the mysterious cult of Dionysus, the God of wine. This well preserved villa, clearly had a wealthy owner, as a series of fine dining and party rooms have been discovered over the time – all of which makes for great viewing. Click the link here if you want to locate the sites discussed in this article.